Outside the aquatic world, the University of Louisville swim team largely goes unnoticed. UofL, however, is making waves where it counts. 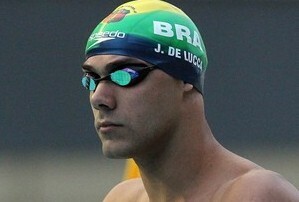 Joao de Lucca, who hails from Brazil, is among the best at the collegiate level. He was the first male athlete in 19 years this year to win both the 100-yard and 200-yard freestyle events in the NCAA Swimming and Diving Championships this spring. Successfully defending the 200-yard win from last season, he finished his college career with three of the four NCAA men’s swimming titles in school history. The first was won by Carlos Almeida in the 200 breaststroke in 2012. UofL finished 11th in the NCAA Division I competition.